We continue our Pray A to Z series and F is for Foster Families. Get caught up on the series here. Download your free printable prayer cards here. Foster families provide a much-needed service to hurting families in our communities. They do so with love and without accolades. I’ve watched my friend Nicole Hopkins as she’s served a number of children in her home over the past couple years. I’m so glad she is sharing her story with you today. We have been a foster family for about two and a half years. 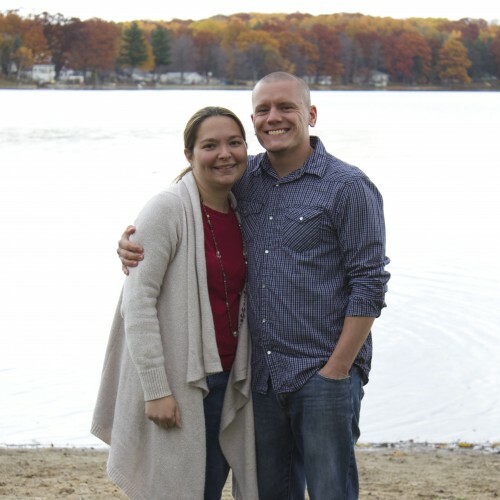 My husband and I both felt God nudging us in this direction in a few different ways – through other foster parents, a speaker at my husband’s Bible study, as well as some personal situations in our extended family. Adoption was at the back of our minds, but we were open to where God would take us with foster care. We took the licensing classes at an agency, started all the paperwork, and had a home study. The classes were thorough. They seemed meant to scare you, and to make sure you knew what it would take to welcome foster children into your home. But nothing can prepare you like actually doing it! We were licensed for two 0-12 year old children. We received our first call before we were even licensed! We were told that they would expedite it because these children needed to be placed quickly. We said yes to brothers, ages 1 ½ and 2 ½. At the time our youngest biological child was 2 years old, plus we had 3 elementary aged kids. We said yes because we knew it would be a short-term placement, while their relative was working on getting a license. We fostered them for 4 months. They were very active little boys, and I was always worried about them getting hurt. It took me by surprise that the responsibility of caring for someone else’s kids, a stranger’s kids, felt like a physical weight on my shoulders! It also took me by surprise that their parents were so thankful and appreciative. I expected resentment, and it wasn’t that way at all. We were part of their support system and their co-parents. That was a beautiful part of the experience. Since then we have fostered 7 more children, and I know that it’s not always the case! As foster parents we know that the goal is always reunification with the child’s birth family, but sending them back home isn’t something you can prepare for! From the moment the children come into my home, they are MY kids! They are part of our family. So even knowing they will likely leave, I pour myself into them like my own children. Something people say to me quite often is that they could never foster, because they couldn’t let them go. I grieve these kids when they leave. I don’t regret loving them that way. They deserve to be loved like that, and even though it hurts when they leave, it’s worth it. It is so hard on the children to be away from their families, no matter what kind of life they came from. They may not always appreciate our efforts to include them as part of the family, because they are grieving their family. After our first placement moved in with their relative, we welcomed two new foster sons for 2 ½ months. They were 2 years old and 3 ½ years old. The 3 ½ year old said many times that we’re not his family. He asked about his birth family constantly. He missed them terribly, and thankfully was reunited with them. A year after he left I received a phone call from his step mom saying he asks about me all the time, can I come spend some time with him? Of course! I love knowing that God was using me to impact those boys. We now have 2 little girls that will not be returning to their birth family, and we have the privilege of being their forever family. The adoption is still pending, and I know with our foster care system that I can’t truly count on anything until it’s said and done, but we are very close! Arriving at that decision was very difficult. From the moment the girls came to us, I felt like they were meant to be ours, and it took my husband longer to feel confident that this is what God wants for our family. Our prayers for peace about the decision have been answered, and He has brought us to this point! When you pray for foster families, lift up the marriages of the foster parents. It is very stressful working with the agencies, the courts, and the birth parents. We have to make a lot of difficult decisions, usually very quickly! Foster families are constantly changing, with every new placement there are new appointments, new caseworkers, new birth families, and of course the new children going through the trauma of being removed from their families. Our 4 biological children have become very flexible, but so much change is hard for them too. We have to balance our time with each child and make sure they’re all being nurtured. Your prayers for families like ours are crucial; sometimes we get so overwhelmed we don’t know how to pray anymore. Knowing others are praying is encouraging. Other ways we have been supported as a foster family are practical; people have dropped off diapers, meals, and clothes. Family and friends help us with childcare and transportation for our older kids. We have seen God provide in countless ways. Nicole lives in Michigan and has been married to Rick for 15 years. They have 6 children from ages 3-11 years. Nicole is a stay-at-home mom with an accounting degree, which is currently being used for volunteer work with her church and a local camp. When Nicole sent me this post, she recommended I watch the short film “Removed,” and include a link. This story showcases a foster girl’s journey, and is incredibly well-done and moving. I do want to include a trigger warning regarding domestic violence. Write down names of foster families in your community. Write down names of agencies serving the children, and all the families involved. Pray for wisdom for both the social workers and the foster parents. Pray that God might raise up more foster families. Pray for the marriages of foster parents, for strength, wisdom, and the ability to give each child the attention and love they need. 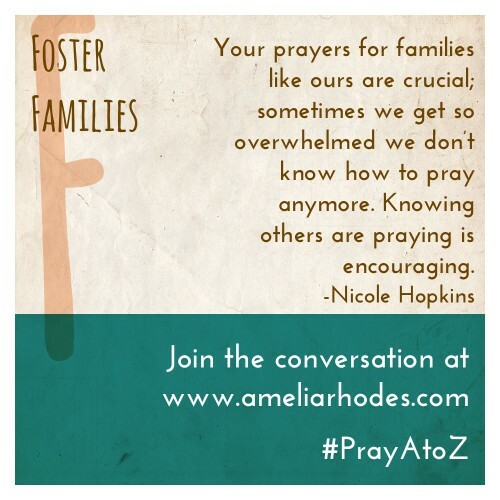 #PrayAtoZ and F is for Foster Families. Nicole, thank you for all you have and continue to do. God gifts families to foster and its such a needful act of love. We just let go of a student at our school as she moved into the foster care system. So difficult, yet so comforting too when you know they will be so loved. I love that, pray is so crucial for all involved.